While gum disease can impact your oral health, it also can negatively affect your overall health. It could contribute to serious conditions such as diabetes, heart disease and stroke, and kidney disease. That’s why addressing gum disease as soon as possible is vital. 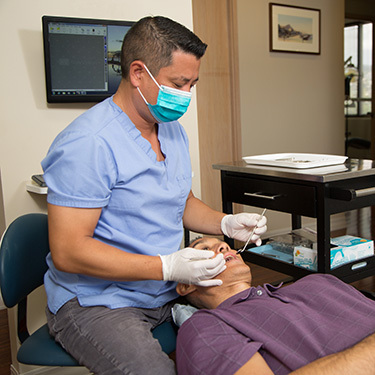 In addition to your home care, dental cleanings performed every six months at Premier Dental Group HI will go a long way toward keeping your oral health at optimal levels. There is another nonsurgical procedure that can benefit those with periodontal disease. Scaling and root planing is considered the gold standard for treating periodontitis. According to a July 2015 study in the Journal of the American Dental Association, individuals who have chronic gum disease can benefit from scaling and root planing. Scaling. All plaque and tartar are removed above and below the gum line. Root planing. Teeth roots are smoothed out to help the tooth reattach to the gums. More than one visit may be required depending on your situation. A local anesthetic is available to ensure your complete comfort during the procedure. Afterward, you may have some discomfort and sensitivity. Gums can also bleed or feel tender and swollen. We may prescribe medication or mouth rinse if needed. Maintaining healthy oral hygiene habits such as brushing and flossing is essential. Contact us today to arrange your oral health evaluation!